Irwin & McCabe Dental Group offer regular children only dental days, dedicated to providing children with a fun, non-threatening dental experience. Each session has a different theme and we encourage the children to join our staff and dress up. Dentists, dental hygienists, dental assistants and registered teacher in attendance. 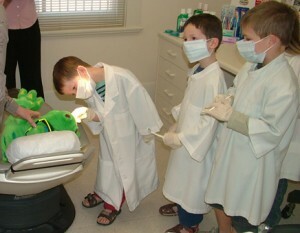 The Child Dental Benefits Schedule was introduced by the Australian Government to provide financial assistance to families and to encourage children and teenagers to care for their oral health and to introduce them to preventive care solutions by having regular examinations and hygiene appointments. The Child Dental Benefits Schedule provides dental benefits up to $1000 per eligible child every two years. This programme is means tested plan and eligible families will automatically receive a letter in the post. Payneham Road Dental Centre chooses to bulk bill for all services that are claimable under the Child Dental Benefit Schedule. There is no gap payment for most services including examination, hygiene visit, any necessary x-rays and restorations. Dr Lena Regier and Kate Foulis are our children’s dental program practitioners. They have a special interest in early prevention and are focussed on giving your child the best head start they need to maintain healthy attractive teeth for life.